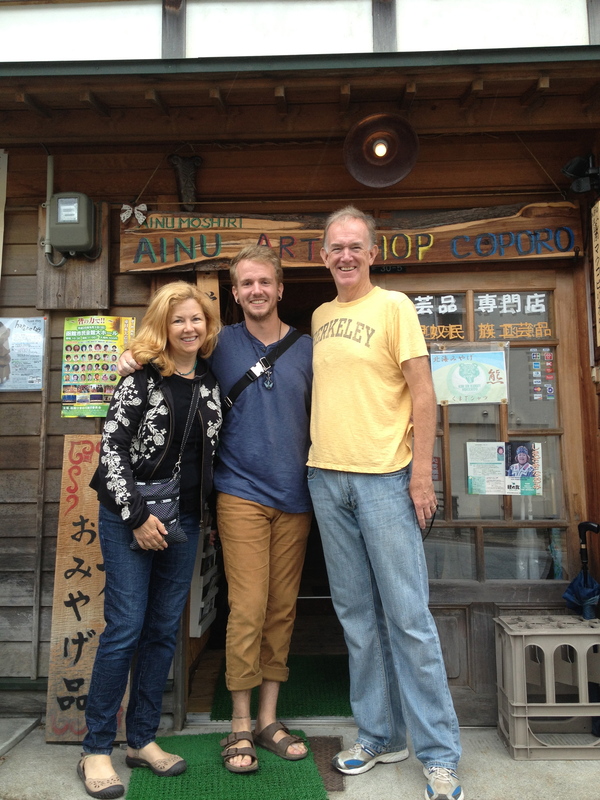 Having graduated from my spring term at Kanda University, I met up with my parents in their downtown Tokyo hotel before embarking on our two-week long trip throughout northern Japan, stopping at holy mountains, secluded hot springs and ancient samurai towns along the way. During my freshman year, I wrote a paper for Professor Stockdale’s Japanese Religion class, comparing the cultural similarities between the various tribes of the Pacific Northwest and the Ainu peoples of Japan—specifically Hokkaido. I was captivated by their appearances, the men with thick beards and bushy eyebrows to match, the women with worn, leathery faces and decorative lip tattoos, as well as their art, with its emphasis on harmony and symmetry. Also without knowing much about the Pacific Northwest tribes, besides the fact that they are ethnically related to the Ainu along with the Sakhalin and Aleuts, I wanted to know more about their neglected culture. Through my research, I discovered that certain tribes within the Pacific Northwest region shared identical salmon ceremonies with the Ainu, prompting me to bookmark the subject in my head for further study. Although I didn’t receive the research grant I had needed to study the Ainu this summer, my parents and I decided to plan our trip with Hokkaido in mind as our final destination. 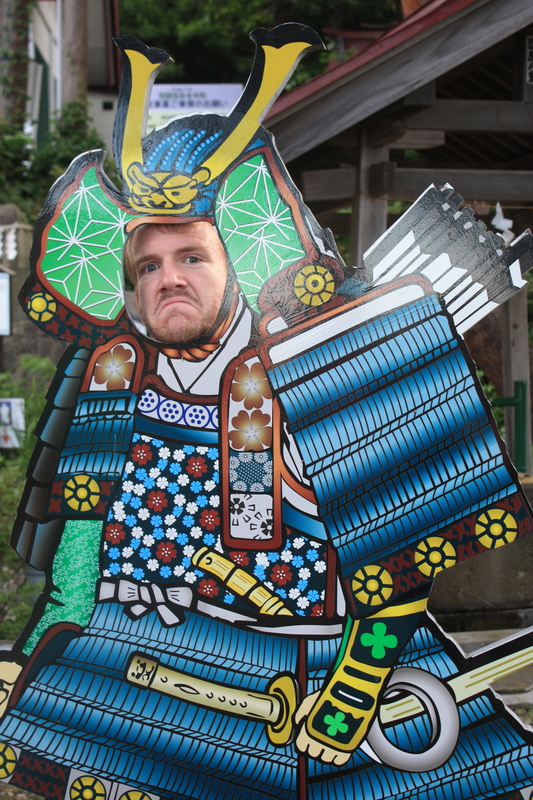 As we traveled around Northern Honshu, I prepared for our time in Hokkaido by reading up on the current state of Ainu people, which is, sadly, quite dismal. 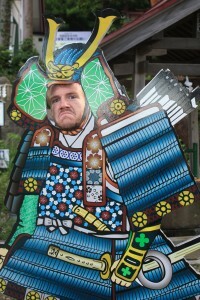 All the traditions that I had become so fascinated with, e.g. the bear sacrifice ceremony, were revealed to be lifeless relics of a bygone era, before the Ainu were assimilated into the Japanese collective. 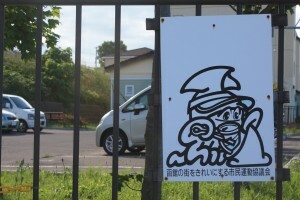 In the 21st century, many Ainu people have succumb to appealing to the tourist market by carving up images of bears and salmon which was taboo only a half-century ago (the bear and salmon are both revered as holy, like the Hindu cow). Thus when I boarded the train from mainland Japan to the land once known as “Ainu Mosir,” or “Land of the Quiet People,” I resolved to keep my expectations low and experience Hokkaido as it is now—detached from the Ainu culture that once reigned free throughout the northern wilderness. 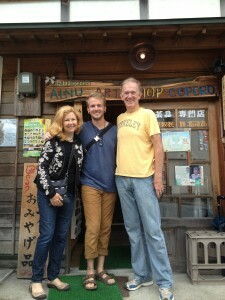 Ascending from the depths of the world’s longest underground tunnel, a whopping 53.85km, my parents and I emerged into the dew-drenched greenery of Hokkaido’s southernmost peninsula. In another twenty minutes, we reached the outskirts of Hakodate, a quaint port city once renown for its important role in trade with the West. These days, more people know Hakodate for its beer and squid, both of which are advertised on posters all over the city. 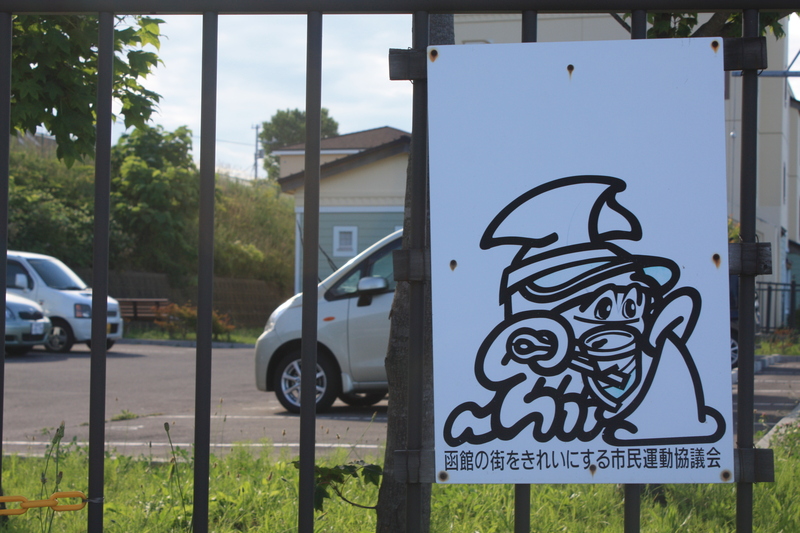 Apparently, even graffiti in Hakodate utilizes the squid to make recycling look cute. As my stomach groaned with lethargic insistency upon arriving at the Hakodate train station, we made the former British Consulate our first stop (the building is now a popular haunt for tourists with a taste for English-style afternoon tea and scones). Feeling especially in need of some royal-sized portions, we ordered a tea and scone set to share, which included cookies, a variety of finger sandwiches, scones, muffins and of course, English tea. After paying our check, we walked through the park to peruse the former Town Hall, a flamboyant building painted baby blue with yellow trimmings and apparently erected during the Meiji Period, due to its gaudy adaptation of Western architecture. But with nothing more than “the Emperor’s Golden Toilet” accompanied by a small gallery to justify the $3 entrance fee, we moved on to explore other parts of the city. From the Town Hall, we wandered off in the direction of the Russian Orthodox Church to find a treasure trove of other intriguing, historically significant landmarks. Amidst the bustle of Hakodate’s summertime tourist traffic, Funadama-ji stood still, perfectly muted in a nearby alleyway. Apparently, the temple was among the first established in Hokkaido by a particularly zealous samurai Buddhist back in the 17th century. I approached the altar, paid my respects, rang the bell and prayed to the powers that be before returning to my parents and continuing with them down Hakodate’s old quarter. Within a minute of walking, onion-domed spires emerged above the skyline and confirmed our arrival at the Russian Orthodox Church. But with no service in session and little more than a paragraph to read about the church, we pushed onward to the Northern Peoples Museum, which featured artifacts of the Ainu and other indigenous peoples in close proximity to Hokkaido. Funnily enough, the concierge at our hotel had to told us that the museum was not worth seeing due to its small size and lack of exhibits. When we experienced it for ourselves however, we realized that she had clearly never been there herself and was perhaps projecting the Japanese norm of devaluing Ainu culture by assuming that the museum was “no good,” as she had said in Japanese. The museum turned out to be very impressive, comprised of three accomplished Hokkaido University scholars’ collections which highlighted aspects of Ainu religion, hunting, cooking, clothing, etc. My favorite piece in the museum was not an artifact at all but a painting which depicted the various rituals and celebrations that occurred within a given season. Though their meanings are obviously simple, I think the characters look particularly beautiful when written in watercolor ink, as the piece displayed. And as a student of Japanese, it’s refreshing just to be able to understand all of the kanji on something for once. Accompanied by the twilight haze that had descended while we were inside, we walked from the museum toward the pier in search of a good restaurant to suit my dad’s less adventurous tastes; thus we settled on Hakodate Beer Hall, one of Japan’s few microbreweries. However once we started ordering there, it was obvious that beer would be our entree for the night; legitimate food seemed a bit questionable there. My mom ordered a variety set while my dad and I shared a large pitcher of Weizen to complement our dinner of mixed nuts, edamame and salad. After our waiter took his leave, we turned our attention to the stage where a bedazzled lounge singer was beginning to perform renditions of famous Western songs. Later on, I recall recognizing “Memories” from Cats and “I Dreamed a Dream” from Les Miserables, though they were sung in Japanese. When the beer finally arrived, a Weizen-style brew, I was disappointed by its unpalatable cinnamon-like sweetness. However, that didn’t stop me from downing a few glasses of it before retiring for the night. 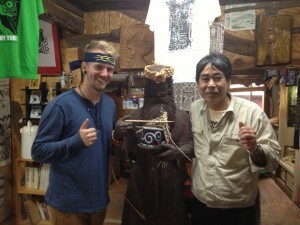 The next morning, while in search of a decent bakery, we discovered an Ainu art shop near where we had walked the day before. Inside, I was pleased to meet the Ainu shopkeeper named Araki, who explained that he and his brother were responsible for the majority of the woodcarvings exhibited in the shop. Curious as to how he identified himself amongst other Ainu, I asked himself if he still attended festivals to which he responded with a sigh and a deliberate shake of his head. He informed me that in the southern part of Hokkaido, their numbers were too small to justify a festival and he couldn’t afford to travel much anymore. Though Araki clearly lamented the deterioration of his culture, the lines around his earthy brown eyes seemed accustomed to bouts of smiling and laughter, brightening whatever darkness existed beyond the limits of his mirth. As my parents shuffled through the t-shirt section of the store, I asked Araki about traditional Ainu accessories, specifically the use of headbands and talismans. He showed me three different embroidered headbands, which were used for specific seasonal festivals, as well as some necklaces that functioned as wards against evil spirits. Eventually, after my parents had decided on some gifts for friends at home, I purchased a blue and yellow headband with a blue necklace to match. We bowed countless times and used the most formal ways to say thank you that we knew before leaving to find some pastries for the long train ride ahead. 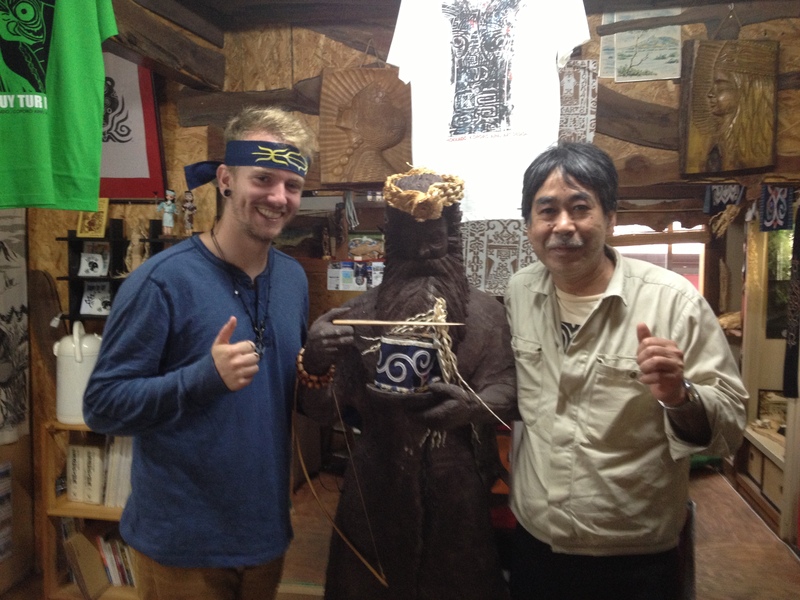 This entry was posted in Tommy Stone '14, Japan and tagged indigenous people, japan, travel. Bookmark the permalink.